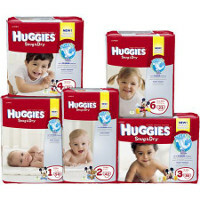 Huggies Diapers/Walmart. I think Huggies are the best ever diapers for my baby girl. Huggies are awesome. I have never had one leak in 2 1/2 years and two kids! I used Huggies on 2 of my 5 children and now my daughter is! They really do keep baby dry!!! !